Southerners love grits but we usually think of them as breakfast. In northern Italy where Polenta originally came from it was a staple to most every meal. Yes true peasant fare like potatoes or rice because it was plentiful and cheap even back into the Roman era. In many countries without corn people use Faro, Chestnut flour, Millet, Spelt or even chickpeas to create the grain mush. 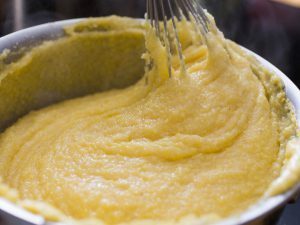 Polenta can take a long time to cook but many methods from the Microwave to adding a pinch of baking soda to shorten prep time. Your grandmother’s favorite southern grits recipe will probably work as well.